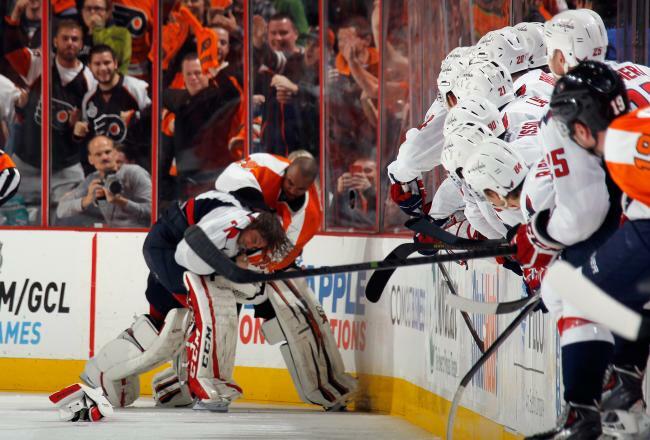 Goalie fights have come under scrutiny after Philadelphia Flyers’ goaltender Ray Emery raced down the ice and forced the Washington Capitals’ goalie Braden Holtby to fight on Nov. 1. There has even been a report via ProHockeyTalk.com that the National Hockey League will discuss 10-game suspensions for goalie fights. Such a suspension may be over board since goalie fights are part of hockey, granted it is a rare occurrence. The NHL would be wrong to eliminate goalie fights all together. However, the NHL may be onto something. A repercussion for goalies that leave their zone to fight could help eliminate instances where a known fighter, Emery, forces an unwillingly adversary, Holtby, to a fight – more on that later. A three-game suspension may be just what the League needs to help better control such situations. With that said, there needs to be certain stipulations in which it is within the rules for a goalie to get involved in a brawl. We’ll stick with the aforementioned teams for this example. Say the brawl occurs in the Flyers’ defensive zone and Emery gets involved. This puts the Flyers’ in the advantageous position of having an extra guy with the gloves off. Therefore there should not be any repercussions for Holtby coming to the aid of his teammates and evening out the numbers – this is especially important since there are only four officials on the ice to break things up. Plus Emery has done nothing wrong because he is still in his zone. But say both goalies leave their respective zones to square off at center ice, much like the classic Chris Osgood vs. Patrick Roy fight in 1998. Do you penalize both and suspend them for say three games after? No way. Both are willing combatants that skated to center ice to throw punches at one another. There is nothing wrong with two players willingly fighting each other, regardless of their position. The only time a suspension should even come into the question is when something like the Emery vs. Holtby fight happens. Emery was out of place to skate the length of the ice and go after Holtby, who, repeat, didn’t want to fight. The officials made the right call by giving Emery a game misconduct and sending him to the locker room early. But that isn’t enough to persuade such actions from happening in the future. A three-game suspension for a goaltender who skates to his team’s offensive zone and forces a fight upon an unwillingly adversary could be just the thing to dissuade such situations. It wouldn’t eliminate goalie fights, but it would help protect guys like Holtby who don’t want to fight. Last but not least, Emery’s repeated blows to the back of Holtby’s head were a disgrace. It’s understandable if the occasional punch hits a guy in the back of the head. But Emery went off and continued to strike the back of Holtby’s head, which isn’t right. Kudos to Holtby for not turtling, and for smiling afterwards.